Sliced beef sauteed with tomatoes, onion, white wine and a soy sauce reduction served with french fries and white rice. 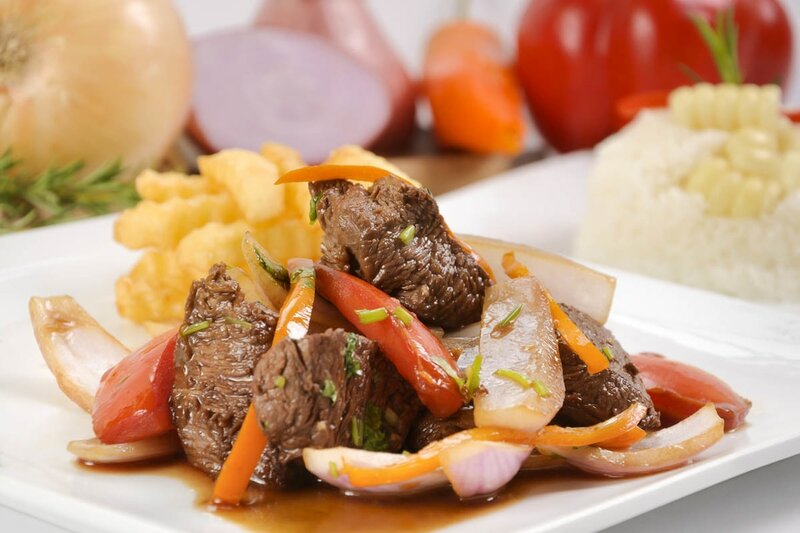 Traditional peruvian dish with slices of beef sauteed with onions and tomatoes, served with white rice, french fries fried egg and fried sweet plantain. Sizzing black angust skirt steak cooked to order, served with french fries, white rice topped with a hat of fried egg and fried plantain. Peruvian style fried rice, Black Angust beef tendering strips mixed in a chaufa sauce with a druzzle of sesame oil. Black Angust Skirt steak served with peruvian pesto spaghetti topped with parmesan cheese. Lightly breadedand seasoned Black Angust Skin served with white rice and fries. Beef sauteed with tomatoes, onion, white wine and a soy sauce reduction and a Linguine Noodles. Black Angust Skirt steak topped with sauteed red slice onions, slice tomatoes pinch of cilantro.